· Hydrostatic Transmission Service, LLC offers new Kawasaki Hydrostatic/Hydraulic pumps built to OEM specifications using Kawasaki parts. · Each Kawasaki Hydrostatic/ Hydraulic pump or Kawasaki Hydrostatic/Hydraulic part is calibrated and tested, to new performance for all Kawasaki Hydraulic/ hydrostatic transmissions, pumps, hydrostatic drives or Kawasaki hydrostatic equipment. · These new Kawasaki Hydrostatic/ Hydraulic pumps or Kawasaki/ Hydrostatic/ Hydraulic parts are ready to install on your Kawasaki Excavator or Kawasaki equipment when you receive them back. · Each Kawasaki new hydrostatic/ Hydraulic pump has a one full year warranty. · If you do not see your Kawasaki Hydraulic/ hydrostatic pump or motor or Kawasaki Hydrostatic/ Hydraulic part listed on our store, please contact us with your Kawasaki model number and we will give you a firm price. Can be up to 10 days for delivery when Kawasaki Pumps are built new from stock. We also carry the following Sundstrand parts, Eaton parts, hydraulic parts, hydraulic pumps, hydraulic motors, hydraulic transmission, hydraulic plates, hydrostatic pistons, hydrostatic shafts, hydraulic shaft seals, Sundstrand hydraulic pistons, Eaton pistons, Sundstrand pistons, hydraulic seal kits, hydraulic bearing plates, and hydraulic valve plates. * With us, repairing and finding the correct hydraulic/ hydraulics pump or hydraulic/ hydraulics motor will never be a problem. * We offer replacement, original pumps and service exchange for all the following. * You can also email a photo of the pump or motor to hydrostatic-transmission.com. For example, Hydrostatic Transmission Service, LLC remanufactures the following from stock plus many, many more makes. * Replacement hydraulic/hydraulics pumps and pump parts for the following agricultural tractors. Tractor CASE I.H. -David Brown-Deutz-Derot-Fendt-Fiat-Ford-Ford New Holland-Holder-Hurliman-Lamborghini-Landini-MB Trac-Loiseau-Massey Ferguson-Mercedes-Renault-Same-Steyr. * Replacement hydraulic/ hydraulics pumps for Combines/ForagersCombine-Combine/Forager Class-Massey Ferguson and Mengele combines. 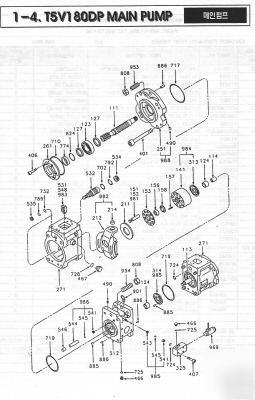 PLEASE LOOK AT OUR OTHER HYDRAULIC / HYDRAULICS PARTS FOR SALE!! * WE ARE SPECIALIST MAILORDER SUPPLIERS IN THE HYDRAULIC/ HYDRAULICS PUMP, MOTOR, HYDAULIC TRANSMISSION PARTS FIELD, AND CAN BACK UP AND SUPPORT TECHNICALLY ALL PRODUCTS WE SELL. * We aim to give the best possible delivery service and charges with quality packaging. * Goods are dispatched either by standard postal service or, where required, by next day Courier service, unless otherwise stated. * Proof of delivery is obtained for all postal dispatches. In the event your parcel does not arrive, it is the responsibility of the purchaser to take their case up with the post office. * For courier service, all deliveries require a signature on delivery.